One of the most accepted and favorite salad for both children and adults. All you need is a magnanimous helping of lettuce leaves. 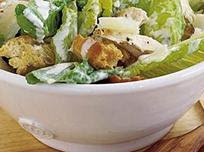 To be precise you need eight cups of lettuce leaves, half a cup of Caesar dressing, 2 cups crouton and olive oil. You have to mix the Caesar dressing and the lettuce leaves till they are varnished with the same. You can then add the croutons and sprinkle parmesan cheese on top. This is quick recipe and can be prepared in a jiffy. It is a very delicious dish and a very refreshing way to greet the guests as well. It is an excellent appetizer.